Every time you send mail to any user in your Gmail account, the contact address is automatically added to our Contacts in Gmail. If you see your Gmail contacts, you’ll notice Other Contacts list. These are the contacts which automatically added by Gmail when you send any mails to users. This is actually a good feature. But for some users this feature might annoy them. For example, if you send mail regularly to some person, and if you start typing their email address/name of that person–then you’ll get lot of contacts suggestion because of many contacts that are stored in your Other Contacts list. In most cases we don’t usually contact them again which are stored in Other Contacts list. So why do we need to store them? it simply waste of our time in looking frequently contacted contacts from that huge suggestion list. For any other reason if you wish to stop automatically adding contacts to your Gmail address book, then follow the below steps. 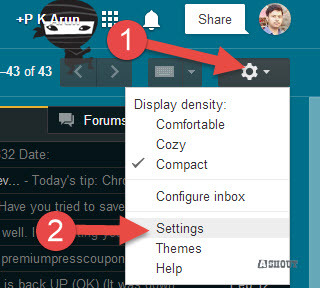 Here you choose second option to stop Gmail from adding contacts automatically to your Gmail contacts, and click Save Changes button at the bottom of the page. From now onwards Gmail won’t add any contacts automatically to your contacts lists.